Currently limited to minimum 20' Container orders! Our import supplier brings in all of the items shown in our navigation, including being the US Importer for a great selection of Conference Tables, Executive Desks, and Chairs. Some items are in stock, but most are simply ordered and normally imported on their next outgoing consolidated container, brought into the Los Angeles port, then forwarded directly to you or your customers. These are easily assembled by two people (smaller items can be handled by one). You should normally allow 12 weeks for your delivery. The Standard chairs (your option from the 4 shown above) will be Black leather covered (natural cow hides, not synthetic), with the wood stained the same as your color selection to match the conference table. 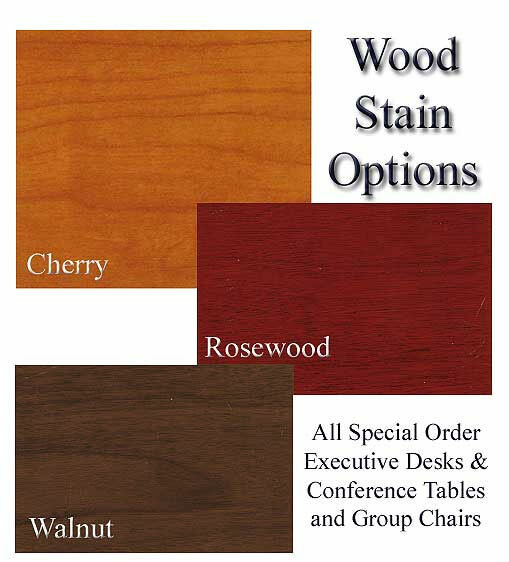 Be sure to click on the stain chart above to see what is available. However, you may request one or two optional leather colors instead of black, and pretty much all colors are always available. So, IF you do not want black, make sure you let us know in advance to substitute for black, and we will see if the colors are currently available. Here are the Optional Faux Leather Colors. Please note that unless you indicate otherwise, the chairs AND the leather desk top inserts, if this style has them, will MATCH...so if you want to retain the black inserts and just change the chairs..you will have to let us know so we can order it for you that way! View Available STAINS - select from menu above. Each conference table is sold with or without chairs. Scroll down this page and you will see our many chair selections. When ordereing, be sure you accurately write down the numbes and quantities wanted, and the color preferred. The 4 standard chair styles that are normally included with the purchase of the conference tables are shown above (or here) but you may also request that no chairs be ordered or upgrade to entirely different chairs. We have a great selection of chairs that may be purchased in any quantities, subject to adjustments in the pricing for quantities and styling. Chairs are less expensive when purchased at the same time as your table or desk (visit our Pricing/Ordering page to print current pricing) After you view these available optional chairs, if you wish to substitute, then simply go to our Contact page and call us or email your questions and we will be happy to assist! All of our Conference Table & Chair Combinations are shipped to us by freight ground (within continental USA only - surcharges will apply to AK/HI/PR or Canada). Current estimated delivery time is 12-15 weeks since there are so many options (stain / leathers / chairs). We are your local provider from the manufacturer / importer and they do not stock these in order to keep our prices low. Once it has arrived on their containers, they will make arrangements to ship it to us (or we can ship it directly to you) and we will either help you assemble your desk or table. If delived direct to you, the shipping company will contact you and deliver your items to your designated location. Freight providers are NOT responsible, and in most cases prohibited from going inside your home. Make arrangements to move the cartons inside by having a person there. If you require additional handling, (inside delivery, for example) this is not included in the shipping price. You will have to request the additional handling directly with the freight company and pay the additional charge directly to them. What if crates are damaged during shipment? The conference tables and chairs are carefully packaged and inspected prior to shipping. Have a digital camera ready when delivered, and take pictures of any damages to the outside of any cartons before opening. There are quite a few crates involoved with shipment of desks and chairs, so if there is any damages, it is highly unlikely that such damaged would render the entire shipment rejected. So, unless there are extensive damages readily apparant, please do not reject the shipment...just take good photos of the damages, as the manufacturer and the shipping company will what to see those when you place any damage claims. DO NOT sign the delivery acceptance without writing, signing, and making a copy of the noted damages. Contact us as quickly as possible, fax or email a copy if what you signed, plus digital images to us at our contact numbers. If concealed damages are found after delivery, please notify us and send images within 5 days of delivery. We will be glad to process your request to replace your lost or damaged orders as quickly as possible. The product represented on this page are special-order imported, so please allow 12-15 weeks for delivery. Because your order contains you colors of stain and leather insets, they have to be special ordered and there will be a 25% restocking fee if you choose to cancel your order, or return the product once you have received it. Once you are shipped the items, you will be solely responsible for all safe return and shipping back to us. No returns or refunds after 10 days of delivery receipt. All returns must be approved prior to accepting back at our warehouse. The Standard chairs (your option from the 4 shown above) will be Black leather covered with the wood stained the same as your color selection to match the conference table. However, you may request one or two optional leather colors instead of black, and pretty much all colors are always available. So, IF you do not want black, make sure you let us know in advance to substitute for black, and we will see if the colors are currently available. Here are the Optional Leather Colors. Please note that unless you indicate otherwise, the chairs AND the leather desk top inserts, if this style has them, will MATCH...so if you want to retain the black inserts and just change the chairs..you will have to let us know so we can order it for you that way!